A couple of weeks off the bike and my bum has turned to putty. It’s been hard going in recent days, especially as a good deal of the ride has been uphill. 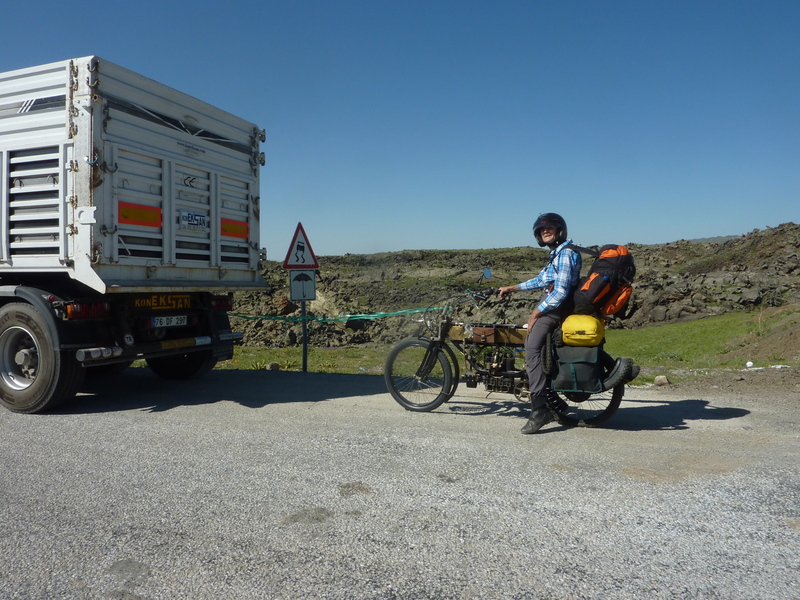 A few days back a truck driver offered to tow my bike but I wasn’t keen on that idea so he gave me a push instead. Eventually I relented and he towed Effie and I to the top of the steep incline. I was knackered and hoped there’d be some easier roads ahead. There’s been lots of snow on the mountains and even piled up on both sides of the road. Unfortunately the road is often too steep to park the bike and take pictures of the surroundings, but I get to take a few shots whenever I can. In this picture we’ve reached the top of the hill. The ride out of Tehran was manic as I’d expected. A three lane highway was made into five lanes at times and it got to be such a squeeze I found myself getting off and pushing the bike on the edge of the road just so I could keep moving without being hit. I’d planned to avoid Tabriz altogether given it’s just another large chaotic city but once on the road again I took another look at the map and figured I could make my way around the outskirts of the city and save doing those extra miles. It meant missing some of the sights to the south but I felt the urge to keep moving on. The temperature definitely got cooler as we gradually climbed westward and I was grateful for the leather gloves Micky had given me as a parting gift. He’d stored the FN while Lynne & I did some traveling around Iran and his assistance in keeping the bike safe was very much appreciated. About 50 ams from border a mountain appeared and the closer I got the larger it grew. Turns out it was Mt Ararat and signaled another country. I took umpteen photos (which will have to wait till I reach an internet cafe to be posted), as it was so awe inspiring. On the Iranian side of the border, a tout, (obvious by his insistence we hurry), tried to hustle me through the offices for a fee of $30 euros. I told him to piss off and did all the paperwork myself. About one and a half hours later I was done and when I returned to the bike the guy had the nerve to still ask for 20 euros! On the Turkish side it was necessary to get insurance for the bike as well as go through the carnet & visa process but it was plain sailing and only took an hour. I remembered from travelling through South America it’s necessary to get in the right mindset for border crossings. They can be lengthy and sometimes frustrating, especially when you don’t speak the language. Still, they’re just part of the requirements of overland travel. Afterwards it’s always a relief to have the necessary boxes ticked and paperwork stamped but it can be exhausting as there’s always the concern that something is not in order. At Dogubeyazit I checked into the Ararat Hotel. Effie was pretty sluggish so was in need of some serious attention. After a bit of work her performance improved but she’s still lacking oomp – maybe she’s feeling her age like me, though it just might be all these hills we’re climbing. Yesterday’s were the steepest I’ve ever climbed (even including Nepal) and I pushed the old girl for 5 kms! Today I pushed for about a kilometer and felt lucky. I ‘d been expecting a much needed tyre pump to be waiting for me at the hotel after mine was stolen with my gear, so hung around for an extra day just in case I was asking the wrong person. Nothing turned up so I headed off towards Lake Van, hoping I wouldn’t get another blown tyre. Special thanks must go to whoever sponsored my stay at the Ararat Hotel – it was warmly appreciated. I’d been spoilt by the excellent roads and though these now weren’t in as a good a shape the scenery was magnificent and made up for any bumps along the way. I learned Mehmet from the Turkish Bikers Club had been in touch with Lynne, suggesting I avoid Van for security reasons and that it was safer to take the northern coastal route. I was already well on my way by the time the message reached me so I figured I might as well keep going, especially given the wonderful people I’d met so far. I was looking for a good camping spot when a couple of families having picnics invited me to join them. It is this spontaneous hospitality that always makes travel so fantastic. On the subject of food, I’d eaten a large tin of peas the night before for dinner at the hotel, so appreciated very much what was offered. I imagine you’re thinking, why would you eat tinned peas for dinner in a hotel? I guess cause I didn’t feel like kebabs, but I know that’s a poor excuse and not surprisingly I’ve gone right off tinned peas! While in Tehran it had been suggested we visit the north because it is so different from the rest of the country. So Lynne & I took the bus to Tonekabon on the Caspian Sea, a great winding drive up into the mountains with specular scenery to enjoy along the way. The Caspian is the world’s largest enclosed inland body of water on the planet. The beach front that we saw was nothing special having been spoilt by huge unattractive hotels but this wasn’t what we’d come to see anyway. Inland a little way is a magical retreat called Khoone Geli (Farsi for mudhouse). Nestled in a village in Tonekabon this haven is run by Farzin & Alexandra, a lovely couple with a young son Sebastian. Tehranis flock here for the weekend to escape the madness of the city. The weather is lovely, the food is traditional and delicious and Farzin offers tours in the mountains through his online business, caspiantrek. We didn’t stay long enough to do one of these ventures ourselves but it’s an unspoiled wilderness well worth a visit for anyone who loves hiking. Khoone Geli, has been built in the traditional manner and is a warm cozy haven during the harsh winter months and its thick mud walls guarantee to keep it cool in the summer. I can certainly recommend this as a wonderful place to spend some time – those who make the journey north will not be disappointed. While there we visited a local pottery and were entertained one evening by a wonderful old shepherd playing his flute. Homemade bread, cheese, fresh salads, divine rose petal marmalade, olives, fruit, nuts, yoghurt – these were just some of the dishes we enjoyed at Khoone Gali. To celebrate Farzin’s fortieth birthday, we set off with the family for a couple of days to enjoy the region, taking in Masouleh, the Guilan Rural Heritage Farm, unique to the area with its thatch, wood & mud dwellings and Rud-Khan Castle with its challenging 1000 steps. I was tempted to turn back halfway to the top but was glad I persevered given how fascinating the fortress turned out to be. Together we all spent the night in Masouleh bunking down in a very old traditional home with sloping floors covered in Persian rugs and with metre thick walls. The houses have flat roofs on which residents sit and chat, sip hot sweet tea or knit colorful woollen socks. After our visit ended we took a bus ride back to Tehran for an overnight stop before Lynne departed for Beirut and I set off on the road again. Where I stopped today, some picnickers warned me to be on the look out for cobras though it didn’t seem to faze them that there might be snakes around, so I figured if I leave them alone, they’ll ignore me too. I’m now heading to Cappadocia and hoping the roads level out a little in the meantime. It’s amazing that I can go from a country with deserts for 2000 kms into the next one with endless mountains. Effie will be hanging out for a break in Istanbul to rest her weary bones…much like me. Still, I keep telling myself it’s getting easier, though I’m not kidding anyone, least of all myself! All the best and maybe we meet some day ! Good to hear from you again. I still have a way to go before I reach the Netherlands – that will come after the rally in Germany. I look forward to meeting you then. I’m about 100kms outside Budapest and making good progress. All’s going well and the roads are flat! Already in Turkey! You are going well, even though there is the eternal resistance of reality (repairs, difficulties etc.). We’re no win the Dordogne, in a comfy nice house (old farmhouse)but today the weather is again not like usual: rain and only 18 C, like London and Amsterdam at the moment. You mentioned a visa of 3 months in Europe: which months do you think you’ll spend in Europe? We’ll be in England (July) and the Netherlands (July 18th-August 12th)and then maybe back to the UK for a week or so before going down again to Portugal and SPain in Sept and Oct. best wishes, Andre de Koning (regards also from Barbara and Sarah just asked about you in a an email: we’ll see her in the UK. Very happy that you are already in turkey; so Germany is coming closer ?, I’ve been very happy to hear that the gear troubles of effi where just a leak of grease. Will mail again a totally update about you and effie and the blog around to my friends and to the old-timer magazines. No news from the FN factory at all ? if they posting your blog or let the works knowing something?? Hi Jacques my old mate. How are things? Yes Germany (and Belgium) are getting closer each day. I’m looking forward to the rally in Sept. Can you send us an entry form when they become available? Thanks for keeping others updated on my trip, that good of you. I’d like to be able to write to clubs back home but time doesn’t allow for much more than what I can report here. Can you send us the contact details for the FN factory sometime Jacques? I’ve been very lucky with the weather to date. Hope it remains good the further into Europe I go. I can’t be this lucky for ever I know, but nice not to have to deal with rain. Mad dogs and steep hills are enough! Hope you’re getting out and about on your machines? Looking forward to meeting in Sept.
keep the stories coming, very well written, enjoy your travels very much. Now we have good internet & phone service it’s getting a little easier to upload what’s happening on a more regular basis. Hopefully there’ll be a lot more to write about in the coming weeks. Good to know you are enjoying the ride too. Yes, it’s a great shot of the mountain range in Northern Iran taken by my good friend Farzin who runs caspiantrek. 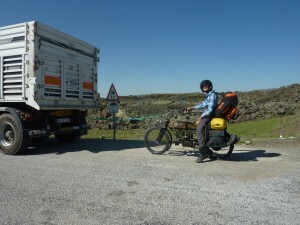 We’ve swapped that one now for a picture of the bike being towed and will add Farzin’s picture to the Flickr library. Happy birthday for June 7. May you enjoy many more and get to ride that old Henderson into the sunset. Always good to get parts back and begin the serious work of rebuilding Good luck with that and keep us posted on your progress. I actually like snakes…not to eat though!